I found my final piece for my summer wardrobe! You are one of the queens of accessories!! I love the hat, scarves and necklaces! The hat looks great on you...I always walk away from your blog inspired to create looks!! Thank you Pam! I so enjoyed your interview on Bella's blog! These are some of your best photos ever! You really rock the Target and H&M things too. You make everything look richer! Thank yo so Joni! I enjoyed your Seattle adventure! Thank you Kathleen...especially coming from the Queen of Hats! 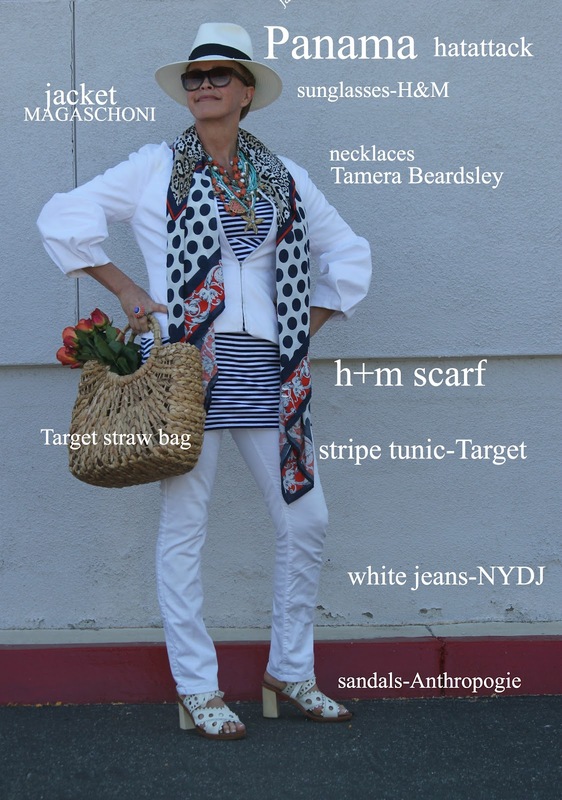 Such a perfect summer look, Tamera - I love the stripes with the graphic scarf, and of course, crisp white jeans. You look marvelous, cool and sooooo stylish. Thanks Lynne! Enjoyed your t shirt over dress idea! Thank you Jen...you are always so kind! The proportions of that hat are perfect. I was at unique la today and was hoping to snag up some jewelry , but I'm guessing you didn't do this round. Thanks for looking for me! I am actually taking the summer off of shows...how was unique la? I loved the space in the Santa Monica hanger. So light and airy. It was very busy but more open so easier to navigate. Really lovely. Good for you for taking the summer off, enjoy. Love this outfit...everything about it. Well done...again! Thank you my dear! Enjoyed your scarf tips today! Thank you my dear! I am so excited that you visit from so far away! I love coming here for the Tamera Show! You look fabulous as usual! Love the hat and the whole look! The treasures around your neck are divine! Is your shop stocked yet? xo! Thank you my dear! So enjoyed your personal style story today! love that hat and scarf tamera! Thanks Megan...congrats on your intel hookup! The jacket is just perfect with the pile of necklaces and the stripes. How interesting that the hat is made from paper straw. Thank you Terri! i enjoyed your weekend photos! You look gorgeous. I love stripes and there is something about dots paired with stripes makes it so exciting - the red flowers and the red of the scarf is perfect. And I admire your beautiful and interesting jewelry. You are fabulous creative. Anne-Marie...and thanks for visiting all the way from Denmark! Tamera! What wonderful photos of a smashing outfit! I love stripes but the way you've mix them with the coral/turquoise jewelry gives me shivers of pleasure- such a lush eye treat! Thank you so very much Bella...and thanks for visiting my blog! Tamera, you look fabulous! 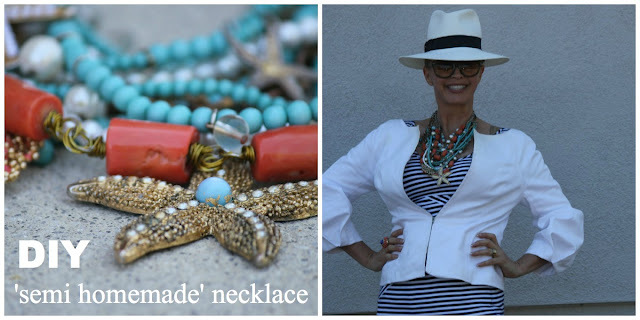 Love the Panama, so chic - and I love how you've piled on the necklaces too. Great outfit. Thank you dear! I'm still on the hunt for a navy blazer after being inspired by you! Such a beautiful outfit post! !I'm in love with striped shirts and I really like how you styled them mixing jewels and huge polkadots! !That jacket has a great fit and the sleeves are fabulous! Thank you so very! i was so excited with your artistic view of fashion! Your hat is the perfect addition to this chic and classy ensemble with the accents of color and mix of stripes and prints. Brilliant display of photos! Thank you so very much Judith! Coming from the true queen of hats...i am honored! i dig how you switched to flats, brilliant! Thank you Gina! I loved your vlog! Once again, you stun like a catalogue model! I love your Panama hat, especially with the glasses. They add a delicious touch of mystery and sophistication. I agree with Melanie! These look like professional model shots. You look fabulous. I really love that very last photo : incredible! PS - I have been on the hunt for those shoes of yours from Loehmann's...the booties...no luck. Boo! The third to last photo, with your hair down and hat and bag in hand, PERFECTION! I love the use of the scarf and the stripe dress as a tunic. So classy! You look fabulous! Love that you resourced this look all over the place. Building a great wardrobe requires creativity!